"You will be missed man. Sorry i couldnt make the service"
"Time doesn't heal our wounds when we've had to say goodbye..."
"Jeri, I am so sorry for your loss. Losing a son or daughter..."
"Jeri - I am saddened to hear of Marc's death. I know how..."
"Dear Jeri & Randy: Words cannot express my sadness. 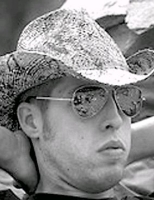 Just..."
Marcus Cody Wieber, 26, of Vancouver , WA, passed away on Sept. 29, 2009. He was born December 11, 1982 in Vancouver, WA. He attended Prairie High School and Clark County Skills Center, studying auto mechanics. He was most recently employed in the construction field. Marc enjoyed travel, hiking, photography, cooking, guns, creative writing, reading and playing with Scout, the family dog. He loved playing his guitar and writing songs. Marc is survived and will be greatly missed by his mother and step-father, Jeri and Randy Howe; grandparents, Frank and Barbara Jeppesen; great-grandmother, Thelma Fox; great-aunt, Eva Brandeberry; numerous aunts, uncles, cousins, an extended step-family and friends. He was preceded in death by his father, Richard Wieber; and grandmother, Patricia Marrion. A celebration of his life will be held on Tuesday, October 6, 2009 at 1:00 p.m. at Columbia Presbyterian Church at 805 SE Columbia Ridge Dr., in Vancouver WA.